Stepping into the house for the tree trimming I smell hints of what I think are pine-balsam, apple-cinnamon and vanilla. The cold follows us in from outside as we pluck Calvin’s coat off and navigate him through the kitchen, hand in hand, into the dining room trying to keep his fingers off of tables and out of guests' drinks. Instantly, our hostess Lauren and a kind friend of hers I’ve never met descend upon us, crouching over to receive our boy. Calvin gets a hug from them both and a piece of orange slice from Lauren's friend, whose name, regrettably, I don't catch. I glance up to see a man wearing felt antlers grasping a glass full of ice and punch. At first his gaze avoids mine while his partner looks curiously at Calvin. I wonder what they are thinking of us, their slack mouths taking sips of booze with blueberries, their blank expressions fixed on us like magnets seemingly void of holiday cheer. Lauren offers Calvin a gluten-free dairy-free chocolate meringue cookie. I pinch off a piece and pop it into his mouth. He seems to enjoy its crisp, chewy texture and opens his mouth for more. He can't sit still so together we squeeze past a few guests on our way to the Christmas tree where we find another handful of friends. We exchange hugs with several then Michelle and I grumble about recent, ignorant, mean-spirited posts on Facebook by so-called Christians whining about the use of the increasingly popular and considerate greeting, “Happy Holidays,” then, in the same posts, vowing to offend others by “Merry Christmasing the crap” out of everyone. Really. 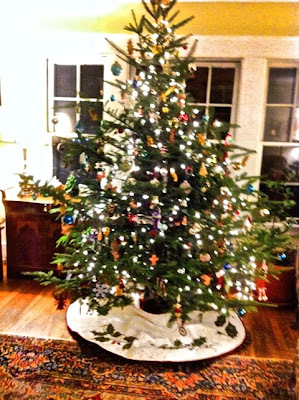 The tree, alight with bobbles and bangles and holiday lights, glows in the cozy room, which is filled with laughter and conversation. Calvin remains quiet and engaged for the most part, but then eventually begins yanking my hair and heads toward the door about thirty minutes after our arrival. When he begins to fuss I tell him that we are going home and he quiets. I know he understands me, and that is a gift of the best kind, the kind that can't be bought in a store, boxed up and wrapped in paper and string awaiting the arrival of Christmas.